You might say ‘Pieris’ in English. Asebi means drunkard horse in Japanese Kanji. Animals don’t try to eat this tree’s leaves. By the way, now there are a lot of cherry trees bloom in Japan. But every year I don’t have any time to see them. When I try to see cherry trees bloom, it is too late. So my younger son went to his preschool from Tuesday. Hooooo. And I could start to work. When I take off, I don't want to go to my office. No work is very good on weekdays for me!! My older son had influenza which was B type. And my younger son had a fever. This morinig I went to a hospital with my older son. My younger son was good this morning. But his teacher called me after that. I picked up him soon. So I went to the hospital with my younger son again. Fortunately they are not bad. So they are OK. I take care them. Anyway I have to go to bed early. That was a first experience pizza for us. We have ever eaten pizza. Our sons like pizza. Usually pizza is cheaper than sushi. And pizza is very familiar food in Japan now. My older son takes lessons of art which are oil painting, making ceramics and rough draing etc..
My son tried to draw "Portrait of Igor Stravinsky" in his art class. This is a copying of a Picasso, who drew STRAVINSKY. My older son likes to make something. But his mother didn't like art lessons when she was young. I heard cazzie learned art. I think her kids like art!?? This picture is not a fire of temple. 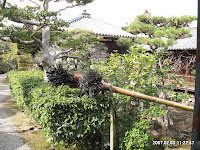 This is Ceremony of the Second Month in Todai-ji temple of Nara city in Japan. This ceremony is very famous and histrical. 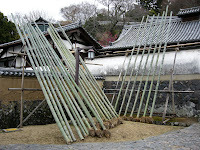 It has been held every spring on March 12 since 752. Priests, with big torches in their hands, run through the balcony of Nigatsu-do which belongs Todai-ji temple. more information, you try to the other link. This was a torche which was fired last year. My uncle took a picture this year. The priests run up this hall. I think this picture is so rare. My uncle took a picture, when he took a walk in Nara park in the early morning. 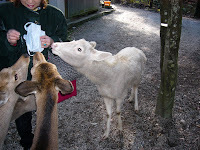 A white deer is rarely born in Nara Park. He said he couldn't see this white deer these days. Unfortunately the white deer passed away. This is not a goat. 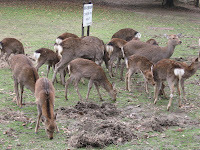 There are a lot of wild deer in Nara Park. They live in here more than 1200years. I was invited a wedding by my former coworker. I had a great time in the wedding party with my friends. Before the wedding party, we attended at the wedding ceremony. We lessoned a father wedding message. Anyway the bride was so beautiful and an excellent cuisine. This is a famous rice cake shop in Nara. My uncle took a video. Maybe this is a regular way. This video is a same shop in Nara. 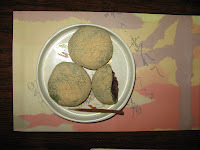 They are campion of making rice cakes in japan. They have high-speed technique. I think this way is special. 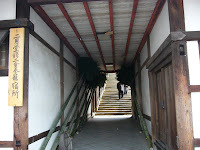 My uncle who lives in Nara, tried to see it when he took a walk. But he didn't have any chance to see it. This is a famous rice cake shop in Nara. My uncle took a video. This is a very slow. Maybe this is a regularway. This video is a same shop. 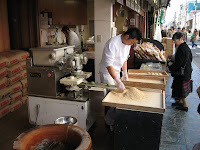 They are campion of making rice cakes. They have high-speed technique. I think this way is special. My uncle tried to see it. But he didn't have any chance to see it.